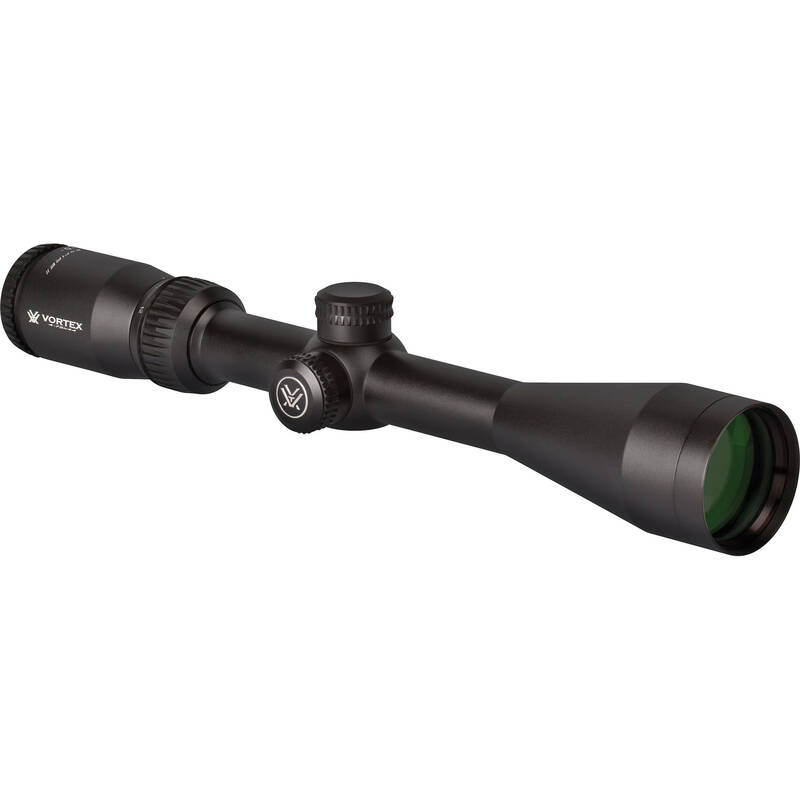 The 4-12x44 Crossfire II Riflescope (Dead-Hold BDC) from Vortex Optics is a cost-effective yet durable variable power riflescope. The 4-12x magnification is ideal for close and mid-range hunting and target practice. A nitrogen purged and o-ring sealed aluminum housing is built to perform in driving rain and extreme humidity. This model of the Crossfire II is configured with a Dead-Hold BDC reticle and low-profile capped windage/elevation turrets. A fast focus eyepiece, fully multicoated optics, and generous eye relief make the Crossfire II a full-featured scope for sportsmen. Customized compensating reticle subtensions minimize guesswork on holdover and wind drift corrections, ideal for shooting at ranges where calculating accurate bullet drop is essential. Fully multicoated optics and an additional anti-reflective coating on the objective and the ocular lenses ensure transmission of bright detail-rich images throughout the entire magnification range. The one-piece aerospace aluminum housing is anodized for a durable non-reflective finish. Optical elements are held in place by machined locking rings that ensure perfect lens alignment even after intense recoil and rapid fire. Additionally, the interior is nitrogen purged and o-ring sealed, preventing driving rain and extreme humidity from fogging the optics. This unlimited, unconditional, fully transferable, hassle free warranty is almost unheard of in the optics industry. Whether damaged by the owner or a manufacturing defect, Vortex Optics will repair or replace the scope at no charge. Box Dimensions (LxWxH) 14.55 x 3.6 x 3.2"
4-12x44 Crossfire II Riflescope (Dead-Hold BDC) is rated 5.0 out of 5 by 1. Rated 5 out of 5 by creed from Exactly what I expected I put this scope on my Tikka 243 and was able to shoot the 100-yd group of my life on the first outing. Then I was able to take my cow elk with ease. Great optic for hunting or target shooting.